VANCOUVER, BC / ACCESSWIRE / October 31, 2018 / Skeena Resources Limited (TSX-V: SKE, OTCQX: SKREF) (''Skeena'' or the ''Company'') is pleased to announce additional Au-Ag assays for six holes from the ongoing Phase I surface drilling program at the Eskay Creek Project (''Eskay Creek'') located in the Golden Triangle of British Columbia. The multifaceted Phase I program is being performed in the historically drill defined 21A, 21C and 22 Zones. Reference images are presented at the end of this release as well as on the Company's website. The Phase I drilling program at Eskay Creek continues to demonstrate the excellent grade and geological continuity of the 21A Zone. The program is designed to infill and upgrade areas of the 21A Zone with low drill density to sufficient drill spacing to allow for future economic analyses and also to collect fresh material for an upcoming metallurgical testing program. Mineralization intersected on section 10,000N (see images below) is largely hosted in the footwall rhyolites with minor mineralization hosted in the contact mudstone as illustrated by an intercept of 9.07 g/t Au, 76 g/t Ag, 10.09 g/t AuEq over 45 m (drill hole SK-18-012) including a higher-grade interval grading 13.06 g/t Au, 84 g/t Ag, 14.18 g/t AuEq over 27.77 m. On the same section drilling intersected 5.39 g/t Au, 139 g/t Ag, 7.24 g/t AuEq over 28.3 m including 8.23 g/t Au, 185 g/t Ag, 10.69 g/t AuEq over 12.45 m (drill hole SK-18-014) located 45 m down-dip of SK-18-012. On section 9960N drilling intercepted 4.16 g/t Au, 204 g/t Ag, 6.88 g/t AuEq over 43.5 m hosted entirely within the footwall rhyolite facies (drill hole SK-18-017). The 21B Zone is geologically and geochemically equivalent to the 21A Zone and accounted for the bulk of mineralization historically mined at Eskay Creek. The 21B Zone occurs as a tabular, stratiform, fault-bounded body characterized by well-bedded, reworked sulfides and sulfosalts interbedded with unmineralized, carbonaceous argillite (mudstone). 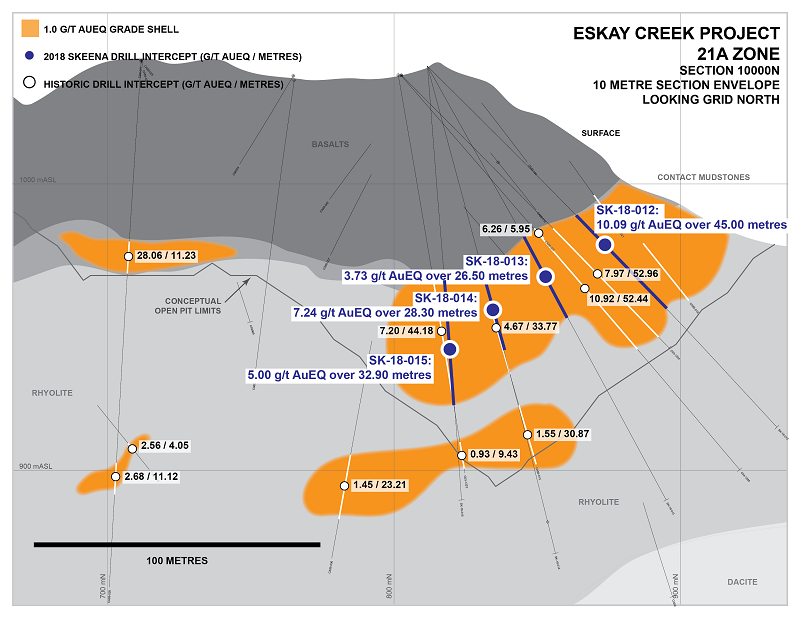 In addition to the extremely high precious metal grades Eskay Creek as a whole (particularly in the 21A and 21B Zones) is distinguished from conventional VMS deposits by the association with elements of the epithermal suite (Sb-Hg±As). Elevated concentrations of Sb-Hg-As in the 21A and 21B Zones are not evenly distributed throughout the zones but rather occur as isolated clusters due to later stage localized hydrothermal overprinting. Underground mining at Eskay Creek was performed using the drift and fill mining method with run-of-mine material either milled at site to generate a concentrate or as direct shipping ore (''DSO''), to smelters. Due to the elevated concentrations of Sb-Hg-As in the 21B Zone, smelter penalties were often prevented via blending with slightly less deleterious material thereby diluting the penalty elements while maintaining a profitable head grade. 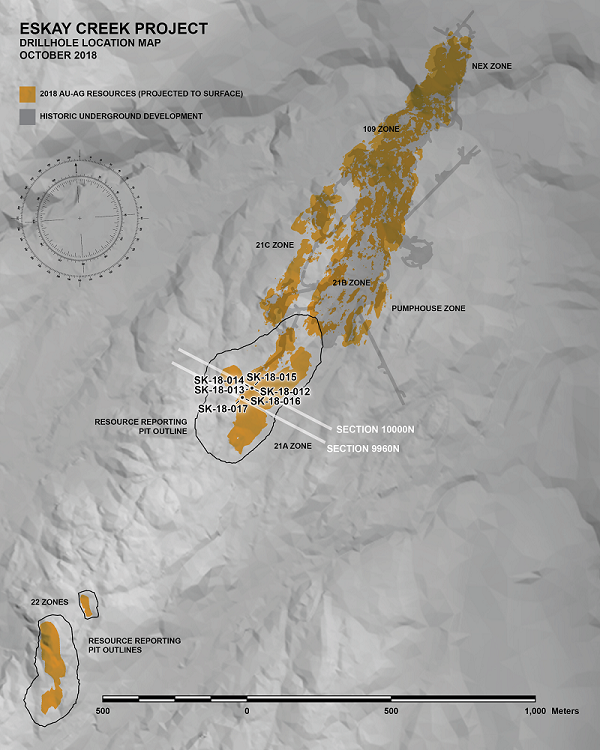 Based upon historical internal technical reports from the Eskay Creek Mine, the parameters for determining reserves in 2006 were based upon a gold price of US$475 per ounce, a silver price of US$8.50 per ounce and a copper price of US$1.50 per pound. The nominal price of gold in 2006 averaged US$603 per ounce and the inflation adjusted price averaged US$738 per ounce, which are significantly lower commodity prices than today. The determination of whether material was milled on site versus shipped directly to an offsite smelter was based on mercury concentrations less than 200 ppm and antimony concentrations less than 1% for onsite milling and greater than 200 ppm mercury or greater than 1% antimony for smelter DSO. The same 2006 mill performance report indicates metallurgical recoveries from onsite milling of the 21B Zone at 84% for gold and 96% for silver. Eskay is in the traditional territory of the Tahltan Nation. Skeena has a positive working relationship with the Tahltan Central Government (''TCG'') and has signed Exploration and Communication Agreements with the TCG that cover the Company's other projects in Tahltan territory (see news releases dated September 25, 2017 and January 24, 2017).